The first quarter of 2018 has gone by quickly. 2018 started with a very busy schedule for the surgical ward and many patients being seen by the outpatient department. During the first four months we have seen and treated a record number of people at Hope Medical Center. A total of 13,535 patients were seen. 1,290 people were seen for wound care. The outpatient department saw the remaining 11,343. The chaplain office received 402 people who came and asked for prayer and we thank God that there were 30 people who have accepted Jesus as their Savior. In January 2018, 1,538 people were treated, in February there were 1,569 and in March a total of 1,747peole. March has broken the record for Hope Medical Center. A total of more than 1,700 patients came for treatment. Everyone has worked long days to see all the patients. 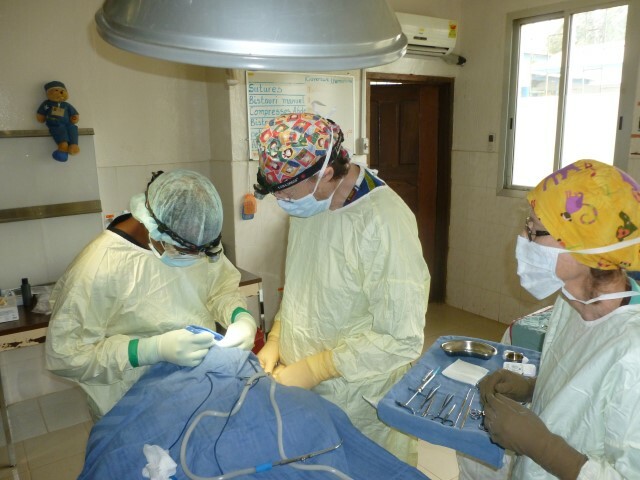 Each year we receive a visiting surgical team specialist in Maxio-Facial surgeries. 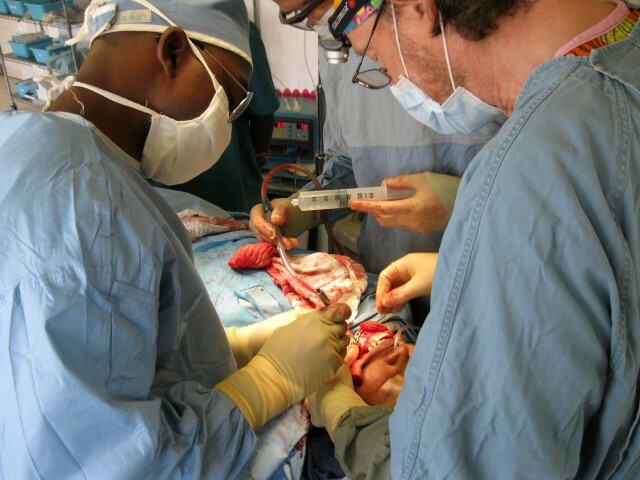 Among the 13 cleft lip and pallet operations they could remove big tumors of the face and neck. It is always great to see the before and after photos of these patients. This year the coming of this team was announced on various local radio station in the surrounding regions. Resulting in many people coming to be seen, not only for surgical problems but also for the general outpatient clinic treatments. In January they treated 1,286 patients with 179 that came for wound care and 28 people came with a dental problem. A total of 45 were operated. The 6th refresher course for nurses started on the 3rd of January. After an entrance exam 11 nurses have been chosen for the 6 months long course. They are a nice group of young men and women who are eager to learn. The first 2 weeks we went over some of the techniques and practical’s. The nurses have a good theoretical knowledge of the material but haven’t always had the chance to learn the practical side. Later, Hope Clinic will be hiring some of them. For the first 12 weeks two visiting nurses came to help mentor the practical techniques. During February another team of visitors arrived. A surgeon and his wife and two of their boys and a team from an Alliance church from Alaska. The team from Alaska worked hard on getting a ceiling placed in the medical warehouse and making cupboards for more storage space. Gratefulness is the word that comes to mind when reflecting back on the events of the past 12 months. Hope Medical Center has seen a steady growth of the number of people that came for treatment. A total of 12,582 people were seen in 2016. Compared with the total of 2015 (8,215) an increase of over 4,000. A new director for administration and finances has been hired since December 2016. From October 2016 many visitors have come to work alongside the medical and maintenance staff.In the month of October, a nurse from the Netherlands came to help, November brought an old friend who came for the 7th time to work with the maintenance department. In January Dr. Giles and his wife came with Dr. Desmond from England. They specialized in head and-face operations. Together, with Hope’s OR team, 10 facial tumors and repairs were preformed and 9 people’s cleft lips and/or palates were restored. At the same time there were visitors who came to work with the administration team. From mid-January to mid-February we had a missionary couple to visit us. She is a nurse and he is a builder. We are now able to go forward with our plans for more bed space for patients and the modification of some houses to create more housing for staff. The last visitors who have visited are car mechanics. They looked at and repaired 4 cars in the week they were at Hope. Patients have seen and felt Gods love and care for them through the hands of each of the workers at Hope clinic. Before we go too far into this new year, we would like to give an up-date on what has been happening at Hope Medical Center. We are thankful for Gods faithfulness to us in the past year. Throughout the difficulties good things have been happening. In February 2015 we reopened the doors for the outpatient care. Ebola was still around in our area but fewer people were getting it. The staff put in a lot of extra work to get going again. We are thankful to Dan who came to visit in October to work on connecting the new water tower to the water system. 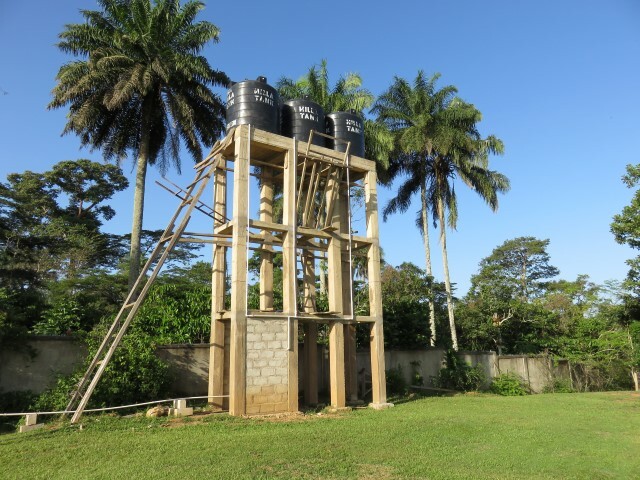 The clinic now has 3 big containers of 3000 liters each. In January Dr. Giles and his wife came for 3 weeks to operate on 17 people with cleft lips/palates and 10 others with facial tumors. 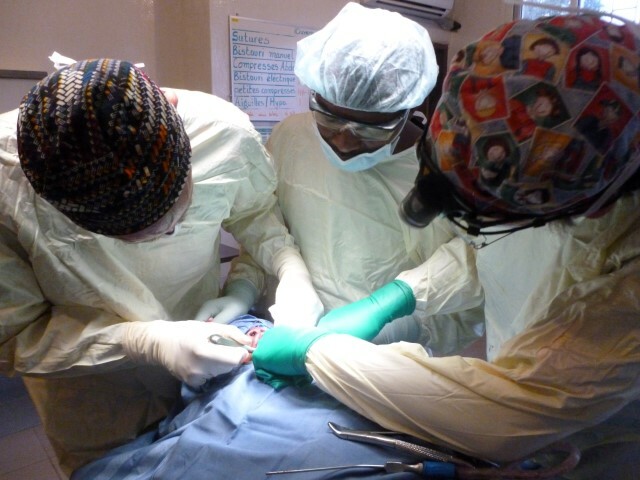 Our doctor Dr. Jean knows how to operate on cleft lips, but Dr. Tony trained Dr. Jean in cleft palate repairs. Thank you for coming and training Dr. Jean. Thank you for your part in these life changing operations. This word has so much different meanings. This word makes you focus on the things ahead but still unknown. The second half of 2014 has been a very difficult time for the team of Hope Clinic. By God’s grace we do have hope and are able to focus again on the great things that God has in store for us. The Ebola virus disease is still roaming around Guinea and neighboring countries of Liberia and Sierra Leone. 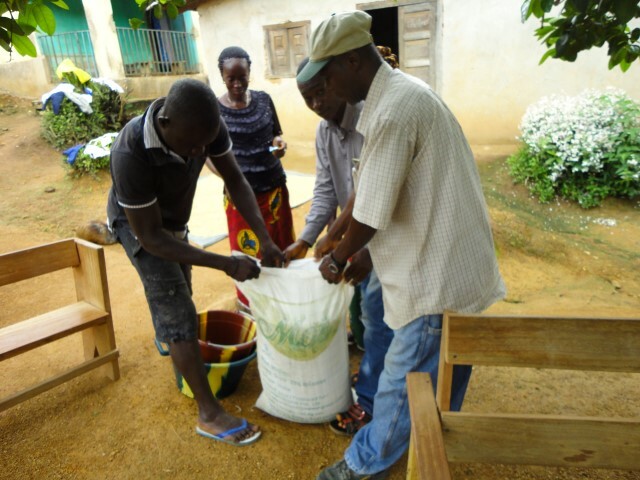 In august 2014 the disease came to our area of Guinea and many people got sick. According the WHO statistics a total of 22,495 (as of Feb. 2015) have contracted Ebola and 8,981 people did not survive. Guinea has had up to 2975 cases of which 1944 have died. Unbelief, fear and ignorance are making it hard for people to understand that Ebola is a disease that exists in other parts of Africa for more than 30 years. There are many worldwide organizations that are helping the Guinean government to fight against the spread of this disease. 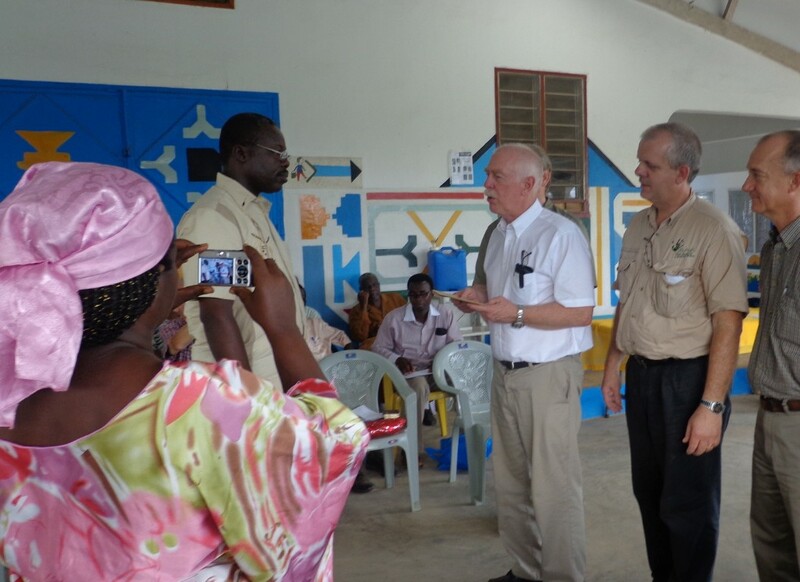 Due to the arrival of a suspect Ebola patient, the leadership felt it necessary to close Hope Clinic on August 17th. They realized that the clinic and staff were not adequately set up to receive suspect cases. The leadersh ip organized training for the staff and started to remodel the waiting area so it would be safer and more efficient to receive suspect cases. An isolation room has been added. 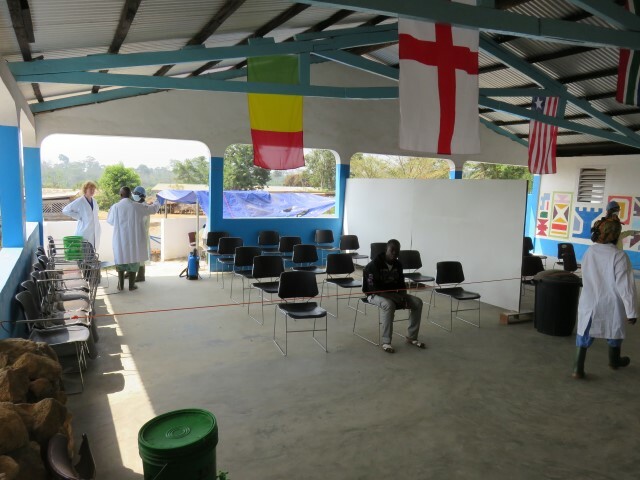 This can become an emergency room when no longer needed for Ebola or suspect Ebola patients in transit. memorial During the period that followed the closure of the clinic we experienced big losses. One of our best nurses, Elisa got sick. She passed away the end of August. Elisa started to work with us in 2007. 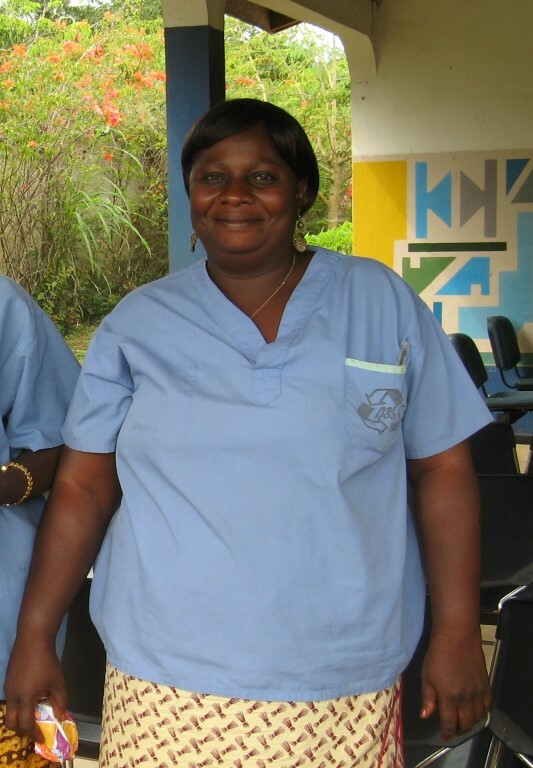 She was one of the 15 nurses that followed the first refreshers course. She became one of our main out- patient clinic nurses. The doctors praised her for her knowledge and diagnosis skills. She cared for her patients. 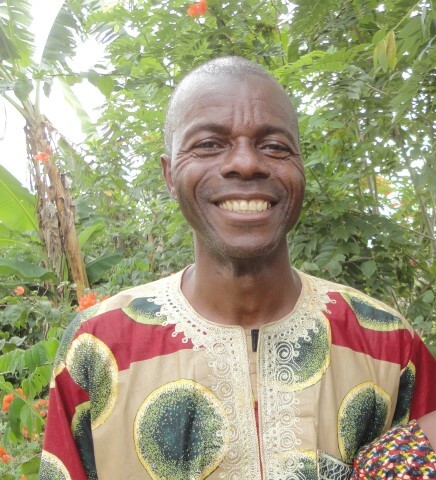 It was just 3 weeks later when one of Hope clinic’s founders and director of the NGO “living water”, Moise Mamy, lost his life during an awareness outreach. He had been asked to join an awareness teaching team, about Ebola, with government officials. In the weeks before there had been resistance to the awareness teaching on Ebola. Teams were chased out of villages by people throwing rocks. You might have heard about the killing of 8 people in southern Guinea on September 16 Moise Mamy was one of the victims. 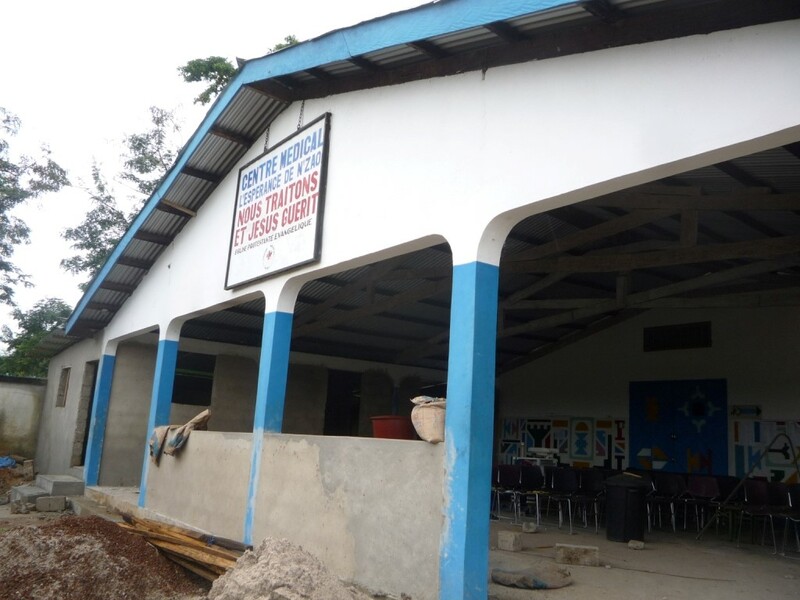 Moise Mamy has been a strong believer and also has been the chairman of the Mano church, he was responsible for the primary and jr. high school that he co-started with a missionary. This has been a major tragedy for the staff and leadership of Hope clinic. 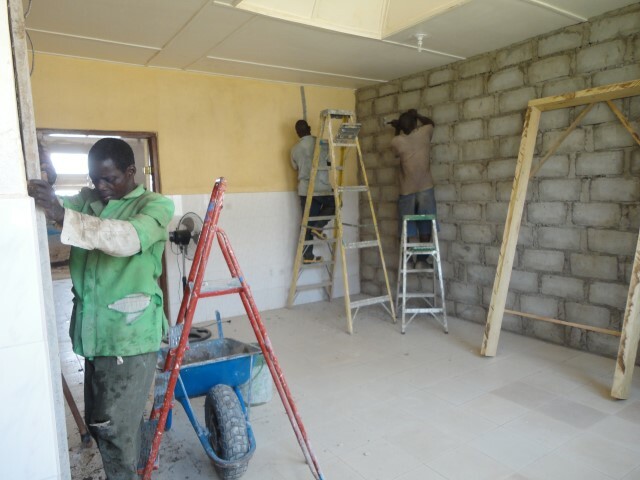 reopening of the clinic In early December 2014 the leadership of Hope started to prepare for reopening of the clinic. We do not know how this new year will look like. 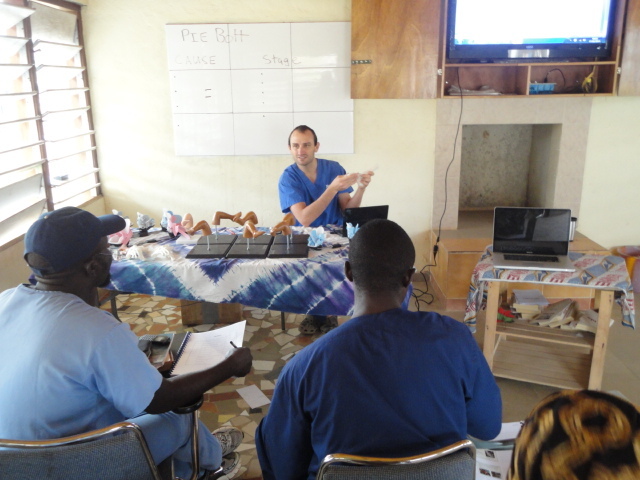 The staff received special training given by the government for caring for patients that might have Ebola. On February 2nd we reopened. We only opened the outpatient clinic. We are following special protocols to prevent possible contamination from patients to staff. 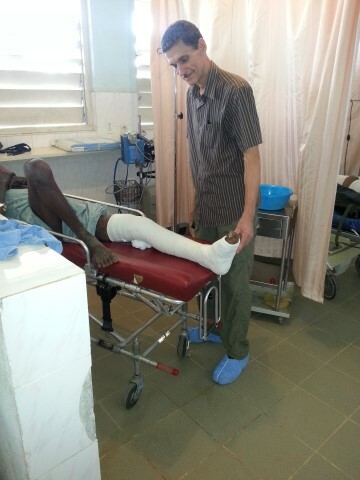 In mid-February Mercy Ships sent Nick to Hope Medical Center to train our staff in the treatment of clubfeet. The technique that corrects this deformation of the foot is called “The Ponseti Method”. The name comes from the last name of the doctor who introduced this Method to the medical world. Hope Medical Center chose two of their staff to follow the training. Jaïrus helped with the translation for Nick from English to French and became a third “Ponseti” specialist. 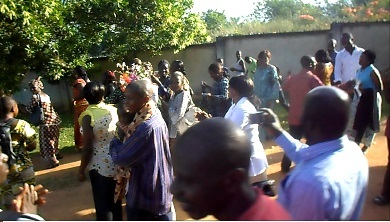 A doctor from the regional hospital in N’zerekore also joined the team. This treatment has the greatest success with children from 0 – 3 years old. Before Nick arrived, we wondered if there would be enough kids in our area that would profit from this treatment. As word got out that we were treating club feet, parents started to come with their children. 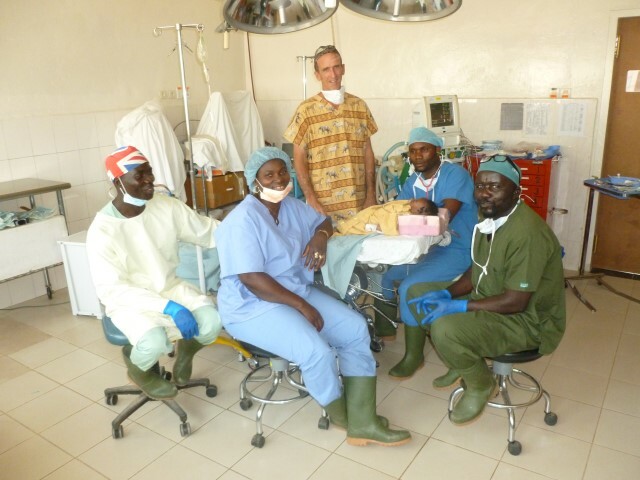 At the moment the team is treating 15 clubfeet. It is quite a commitment for the parents. 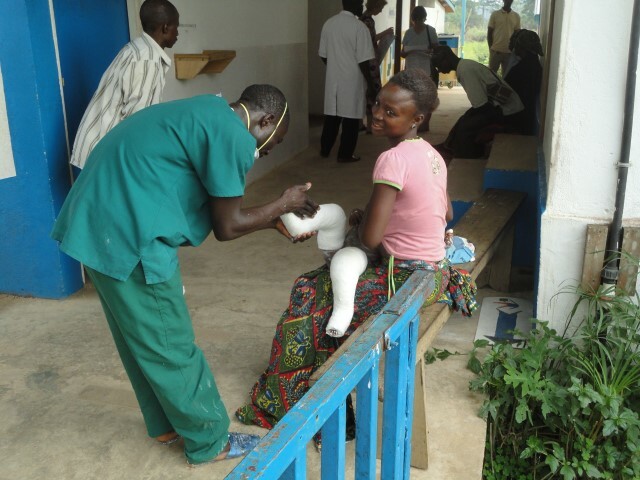 For 4 months they need to come every week to have the casts changed as their children’s feet are slowly turned into a normal position. After the 4 months the children will wear a brace with shoes attached that will keep the feet in the right position. First the children need to wear this all day but later they only need to wear it at night until they are around 4 – 5 years old. The course has been intensive with lots of theory followed by the treatment of patients. Each week big progress has been made by the trainee’s. Nick had to leave the teaching program earlier than planned because of an outbreak of Ebola. our staff this technique. It is wonderful to help these children to be able to walk normally. 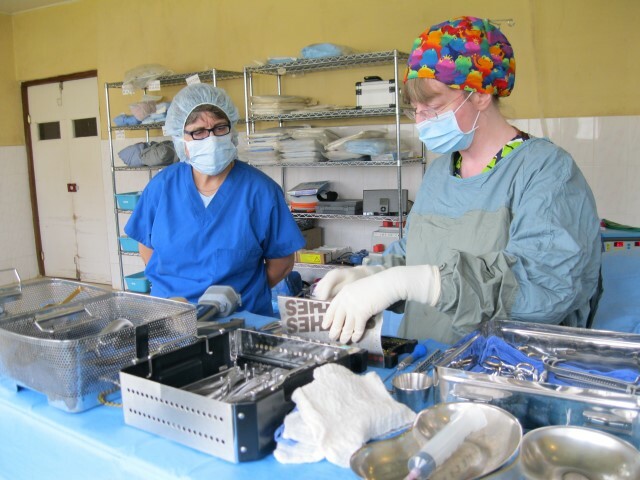 Thank-you Mercy Ships for your partnership and vision for this program. Around March 16 the news of the Ebola virus outbreak in Guinea was announced on the radio. This is a very deadly virus. Once you contract it, the mortality is 25 – 90% depending on the strain of the virus. At the clinic we took the precautions of wearing gloves and masks. The clinic leadership has been invited to be at the 2 weekly meetings with the regional health department along with the World Health Organization, Doctors without Borders and Red Cross who came to take charge of the situation. By the end of April the virus seemed to be under control but just a few weeks later many more people became contaminated. This illness has never been in Guinea before. People are ignorant about it and they are afraid. To eliminate the virus all suspect people need to be kept in isolation for 3 weeks. Many people put into isolation do die and this spreads the fear of the disease and of being quarantined. One family can lose 4-5 members in a short time as they get contaminated through direct contact of body fluids. This happens caring for their sick relatives and during the burial procedures. is a viral hemorrhagic fever and one of the most virulent viral diseases known to mankind. The Ebola virus is transmitted by direct contact with the blood, body fluids and tissues of infected persons. Transmission of the Ebola virus has also occurred by handling sick or dead infected wild animals (chimpanzees, gorillas, monkeys, forest antelope, fruit bats). There is no treatment for Ebola, however as people become dehydrated, fluids need to be replaced. The outbreak started in the forest area of Guinea. It started in Gueckedou. It has since spread to other parts of Guinea, Liberia and Sierra Leone. As of August 2014 more then 3000 people are infected and 1,500 have died. 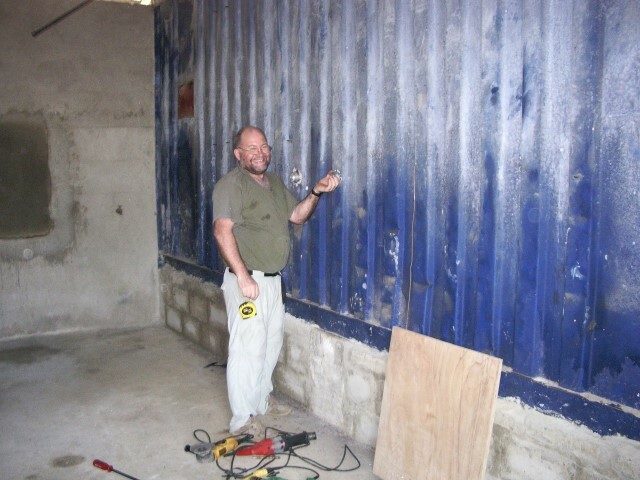 Hope Clinic’s old friend Dan came for two weeks in April to work on the electrical system of the new OR and water system for the clinic. Thank you Dan for coming again. From the end of April till mid-May Dr. Jeff came for the 4th time. With him came an urologist, an E.R. nurse and her daughter. Everyone was very happy with the visit of Dr. Hall and his whole family from June to August. They have been at Hope before in 2009. 2014 has started with a “BOOM”. More than a 100 patients/day came to the Medical Center as soon as the celebrations of the New Year were over. January brought us visitors from England. Dr. Tony and his team visited for the 7th time. 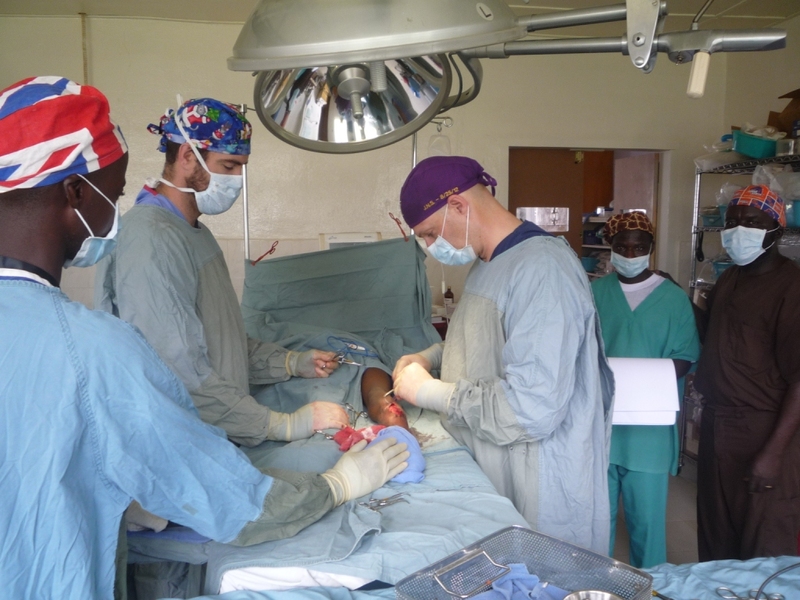 Together with Hope’s surgical team they operated on 21 patients to remove different head and neck tumors and repaired 5 cleft lips. 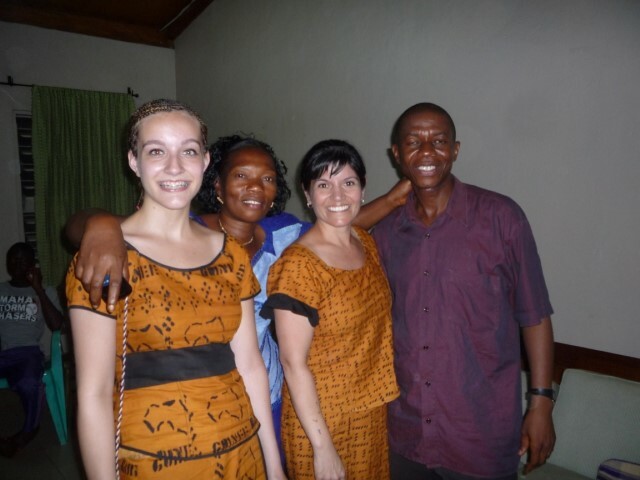 Thank you, Tony, Ann and Caroline, for coming to serve the people of Guinea. 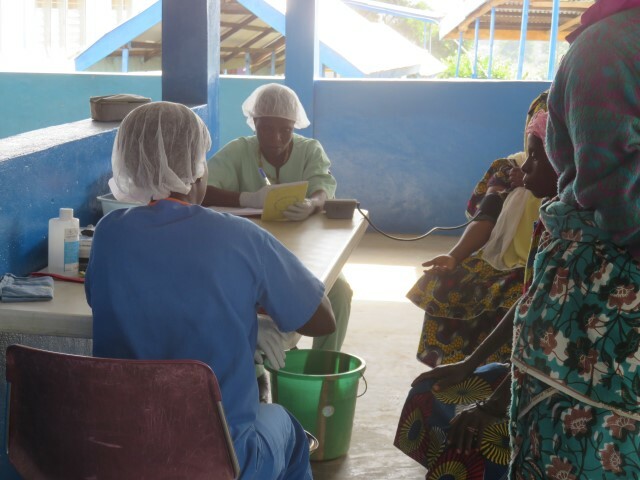 The clinic saw a total of 1,500 patients this month. At the end of December we started a remodeling project for the OR and recovery room. 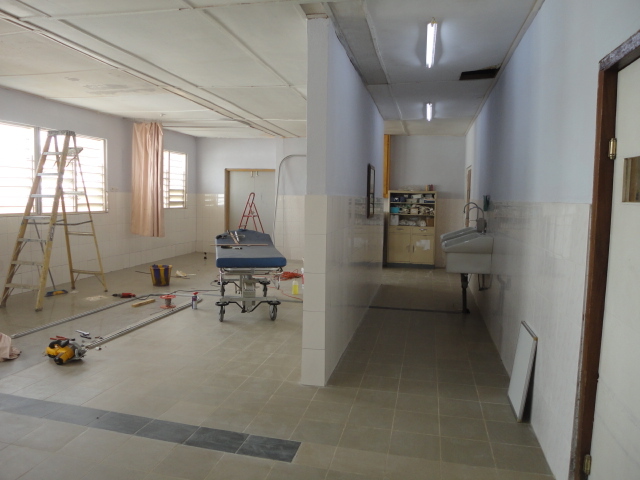 The OR will be divided into two rooms and we expand the recovery room by 2,5 meters. This month we made a lot of progress. By the end of March we hope to have finished the project. 546 of them were hospitalized (of which 225 internal medicine and 321 surgical patients). 306 operations were performed. Some of these went home on the same day and others were hospitalized. 604 People came to the dental clinic: 314 were extractions; 153 were fillings and 134 had their teeth cleaned. In many parts of the world, autumn has arrived with heavy rains and strong winds but here in our part of Africa the rains have diminished and the dry season has started. Most years, “dry season”, means no rain from November until April. In July of this year we welcomed 3 visitors, Dr. Jeff (who has come to Hope Medical center before) and Dr. Bob and his daughter Lizzy. Just after their arrival an ethnic riot started in a nearby city. This ethnic unrest has taken place before and calmed down after a day. This time, however, the violence became bigger than ever before. Many lives were lost and lots of people were injured or lost their homes. 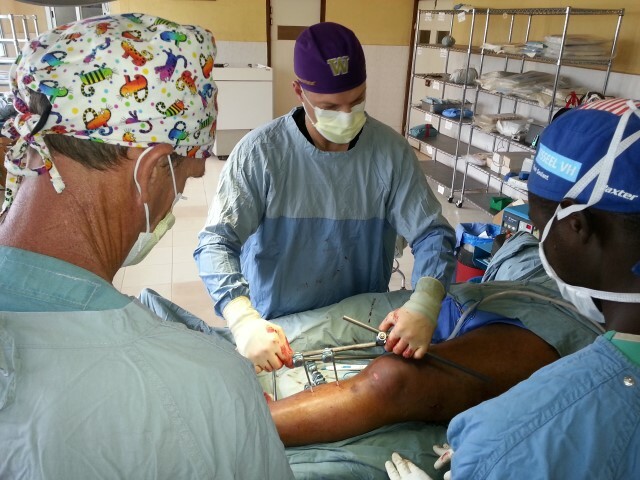 During the first two days our clinic received some of the injured. 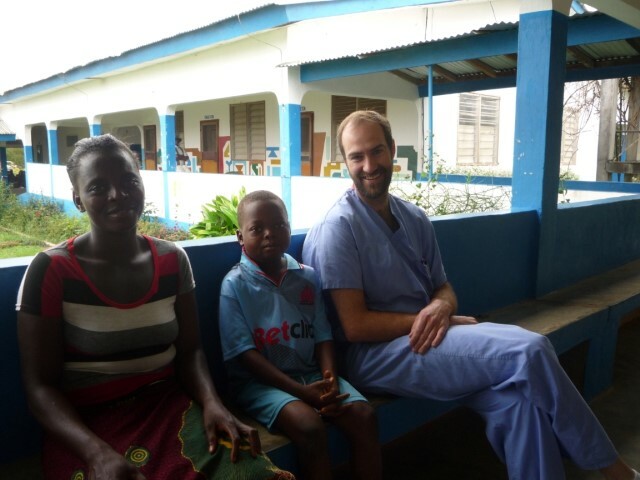 Although it had been a disturbing time for our visiting doctors we were grateful that they were with us and were able to help treat the wounded. They were able to operate on a young man with a head injury and an old man who had laid for two days in a ditch with a broken leg. 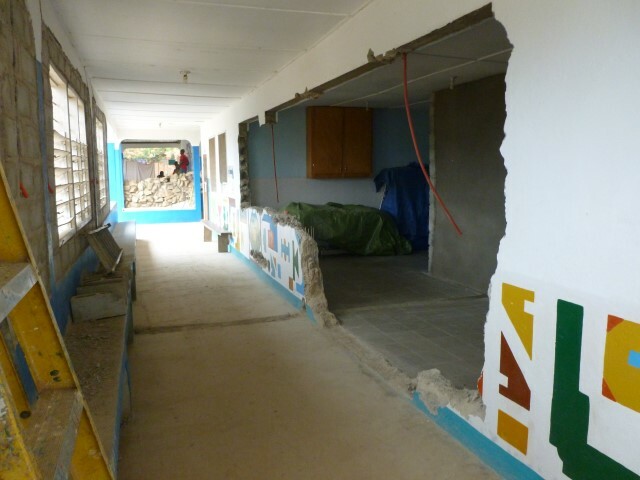 We are thankful that none of the Guinean staff and their families got injured or found themselves in a place of danger. August is always what we call a slow month as the rains are the heaviest and people prepare themselves for the harvest of the new rice. Money to be able to pay for the treatment is harder to find. There were 1085 patients that came for treatment. In September we saw an increase in the number of patients. 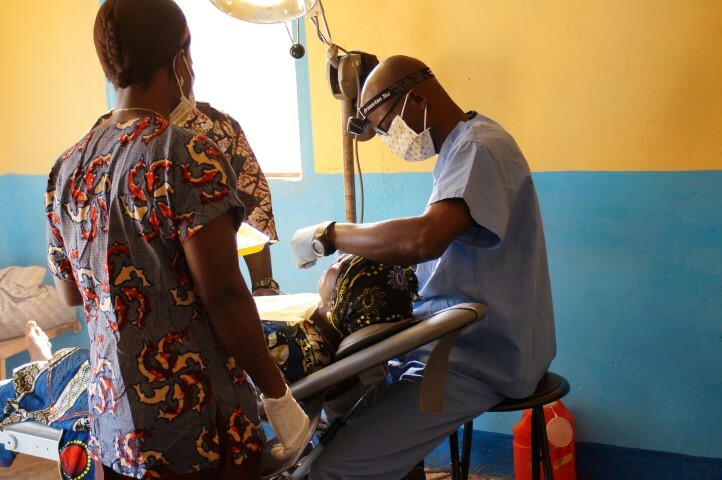 One of our Guinean staff doctors, Dr Guilavogui got sick and wasn’t able to work at the end of the month. In early October the cause of his illness was diagnosed; a big kidney stone was lodged in his right kidney. It became evident that in Guinea there wouldn’t be a good option for treatment so we started looking to send Dr Guilavogui to another country. We were very relieved when friends of Hope Clinic in the U.S. came together and provided a way for Dr Guilavogui to be treated in the States. The removal of this 2,6 cm stone was successful. After an absence of almost 2 months we welcomed Dr Guilavgui and his wife back at our Clinic with an afternoon of sports and a thanksgiving meal. We thank God for this great provision of care and for our friends in the US who were so prompt in aiding Dr. Guilavogui. 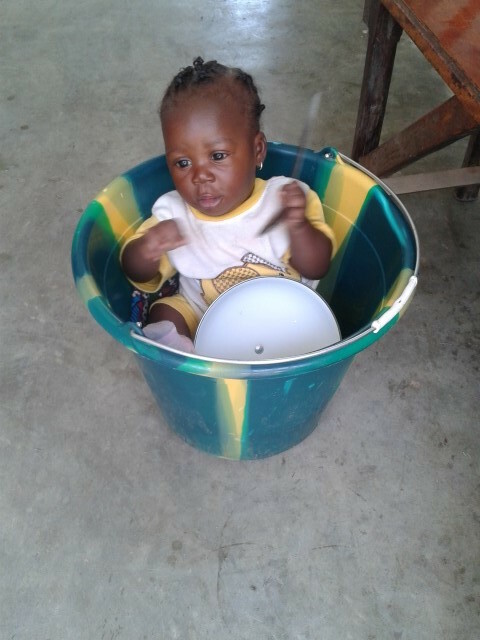 In the last three months there were many small children we treated for severe malaria. An illness that has been around for many decades but still no permanent cure has been found. It takes the lives of many young children. Often the parents seek treatment from traditional healers before they come to the clinic. So, these children are often very ill before we see them. God is faithful, and we have been able to heal most of these little ones. We see God’s faithfulness also in so many other ways. 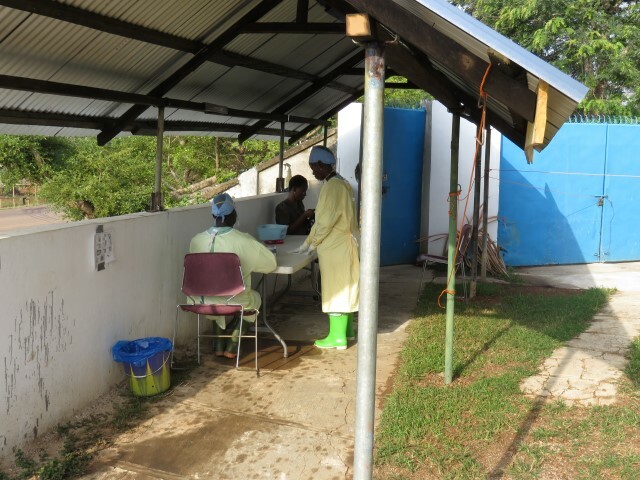 We have seen this year a steady number of people coming to the clinic for treatment. This helps us to pay our staff salaries and other expenses. April and May were months of historical events for Hope Medical Center. From the start of Hope Clinic one of the big goals has always been that the clinic would become self-sustainable and managed by national leaders and workers. 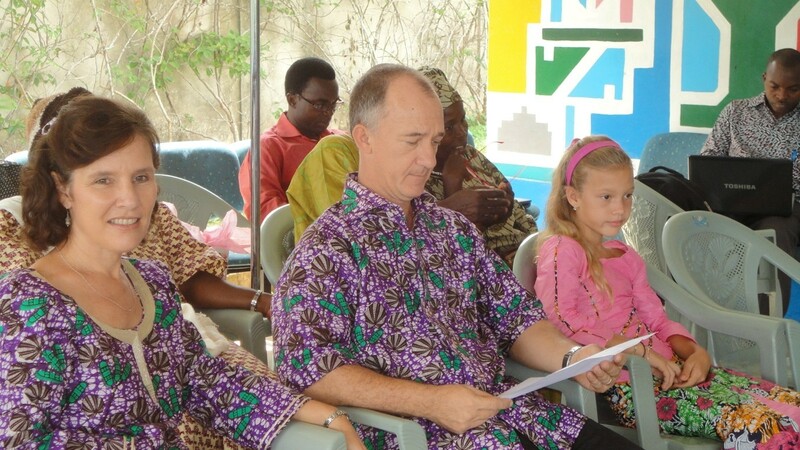 The mission’s organization CAMA-Service from the U.S., has been involved from the beginning of the development of Hope. Throughout the years CAMA-Service has led Hope Medical Center to where it is today. For over a year CAMA-Service and the leaders of Hope Medical Center has been preparing themselves to complete the transitioning to nationalization. CAMA-Service has been working as an N.G.O. (non-governmental organization) in the country of Guinea. 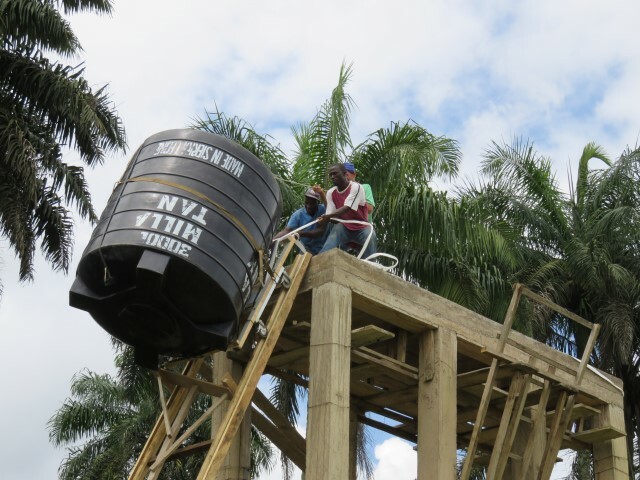 The Guinean NGO that replaces CAMA is named “L’Eau de la Vie” (App. 22:17) or “the Water of Life”. 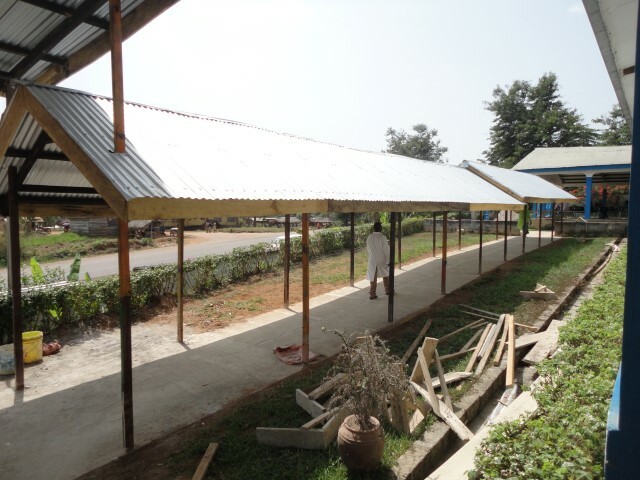 This NGO will continue to help communities to develop. For example: placing water wells, improving agriculture, health education and health services. 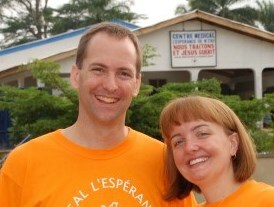 About a month later in May, the Clinic said goodbye to Stephen, Lori and Hannah Albright. Since March 2007 they have been working at Hope as the administrative director and Lori as the short term visitor’s coordinator and guesthouse hostess. We thank them for their years of ministry at Hope and their many ways they participated in the growth of Hope medical center. In April 1,473 have been seen and in may Hope saw 1.522 patients.